A top adviser to Donald Trump on veterans issues who is under investigation for comments calling for Hillary Clinton to be executed for treason was unapologetic late Wednesday, accusing the media of twisting his words. "I never said she should be shot," said Al Baldasaro, a New Hampshire state representative and delegate at the Republican convention in Cleveland. "As usual, the liberal media is taking it out of context. What I said was she should be up on treason charges, and the punishment for that is a firing squad." Earlier in the week, Baldasaro made the controversial remarks on the Jeff Kuhner radio show when asked about Clinton's role in the deadly 2012 attack on U.S. embassy facilities in Libya. "She is a disgrace for the lies that she told those mothers about their children that got killed over there in Benghazi," he said. "This whole thing disgusts me, Hillary Clinton should be put in the firing line and shot for treason." In an interview with The Daily Beast hours later, he repeated the charge. "Anyone that commits treason should be shot," he told news outlet. "I believe Hillary Clinton committed treason. She put people in danger. When people take confidential material off a server, you're sharing information with the enemy. That's treason." When asked by Military Times about the comments, Baldasaro insisted that he was not advocating for the death of the Democratic presidential nominee. "I would never wish on anybody to be shot," he said. "But when you have a server with the names of veterans and the names of agents in other countries, and if somebody gets that information, my fellow veterans are going to get killed. That's my view. Nobody is above the law." He also framed the controversy as a First Amendment issue. "Should I give up my freedom of speech and worry that I'm going to hurt somebody's feelings?" he asked. "I served 22 years in the Marine Corps. I took an oath. I swore to serve. If I say something that hurts someone's feelings, where is our freedom of speech?" It's unclear if Baldasaro's comments may have broken the law. Publicly threatening the president and other government officials or their family members is punishable under federal statute, carrying a prison term of up to 10 years. Secret Service officials said they are looking into the incident. Veterans groups called the comments offensive. "For a Trump supporter who is a veteran to come out and say that a political opponent should be put to death damages the campaign, our community and the entire country," said Bill Rausch, executive director of Got Your Six. "It's ridiculous, and it goes against all military values and what we believe." Rausch said Trump officials should ask for Baldasaro's resignation from all campaign activities, and distance themselves from the comments. 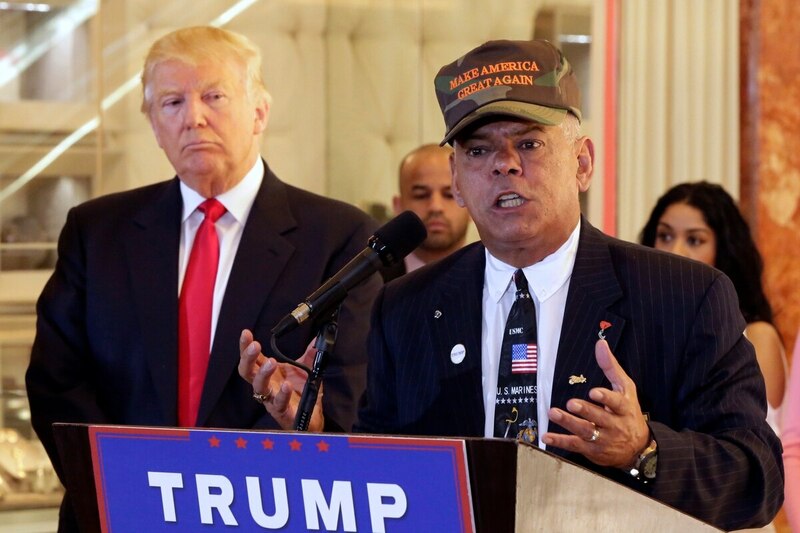 Alexander McCoy, a Marine Corps veteran and organizer behind the #VetsvsHate protests outside the Republican convention, called Baldasaro's new comments "the latest in a long line of inflammatory statements by him and Trump." "This shows again that the Trump campaign is not serious about helping America," he said. Paul Rieckhoff , CEO of Iraq and Afghanistan Veterans ‏of America, blasted both the timing and content of Baldasaro's comments. "In light of recent shooting incidents, this rhetoric is toxic and irresponsible," he said in a series of tweets on the topic. "Especially from a veteran leader." Baldasaro promised to keep discussing the issue, and said he hopes the "unfair liberal media" doesn't continue to misinterpret his words. "It'll be a cold day in hell when I let someone get away with endangering (U.S. personnel) serving in other countries, like (Clinton) did," he said.